Celia Webb SINGPLICITY Glorious Singing Made Simple! 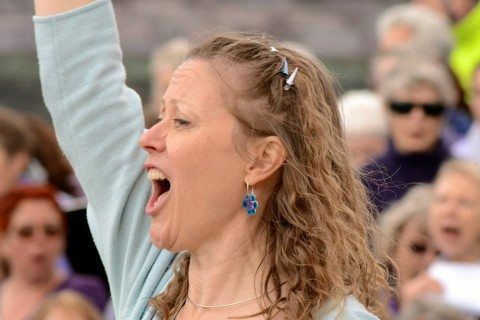 As a Member of the Natural Voice Network since its founding, I embrace its core philosophy and have over 20 years experience leading all kinds of voice work, regular community singing groups and various wonderful residential singing holidays. I believe that vocalising, creativity and song should be accessible to all regardless of musical ability or experience. Therefore, I believe passionately in creating non-judgemental supportive spaces for people to experience letting out the voice they have, their ‘Natural Voice’ – joining with others, and realising what an incredible, moving, joyful, powerful, harmonious sound they can make! It is a wonderful inclusive and accessible way for anyone to participate in glorious harmony singing without any need for previous musical knowledge, skill or talent. I also run many one-off workshops such as ‘Singing for the Terrified’ Seasonal Celebrations, Wassails, Caroling and ‘Wild Singing’; ‘Age Positive Singing’, and Singing for Well-being; I do Natural Voice Sessions for established non-NVN-style choirs, voice technique for theatre and performance including circus; and as the ‘Voice Ninja’ with ground-breaking ‘InspireMe’ company I offer highly effective corporate team-building and voice care with business and charity professionals. As a member of the Sing for Water Cardiff team, I have been a part of organising Sing For Water concerts in Cardiff Bay in 2015 and 2017 (watch this space for the next event! Thus far, we’ve raised well over £75k and counting. In 2014 I began leading annual singing holidays and teaching regularly abroad in Bavaria and at the famously hospitable Maison Anglaise in Morocco. In 2018 I joyously dived into blue Mediterranean seas and leading Singing holidays from the gorgeous East Meets West Turkish Boat. See the ‘Events’ section and treat yourself to coming along! In 2014 I began leading annual singing holidays and teaching regularly abroad in Bavaria and at the famously hospitable Maison Anglaise in Morocco. In 2018 I joyously dived into blue Mediterranean seas, leading Singing holidays from the gorgeous East Meets West Turkish Boat..
Past work includes inventing creative voice play and singing programmes for children and adults with special needs, and those with depression or mental health issues as well as university drama students. For 5 years (until Feb 2017) I also ran Cardiff’s only ‘Singing for the Brain’ sessions for people with dementia and their carers.